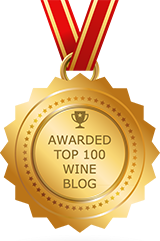 Your Winery Photo is Beautiful and Boring…. But, it can be a whole lot more interesting. 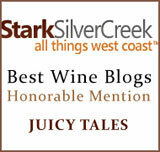 I’ve been helping American Winery Guide; as you may know, if you read my blog. Although my job is complete as it was initially set out, I’m still keeping up with their growth, which is quite fascinating, and independently sharing for your learning pleasure. 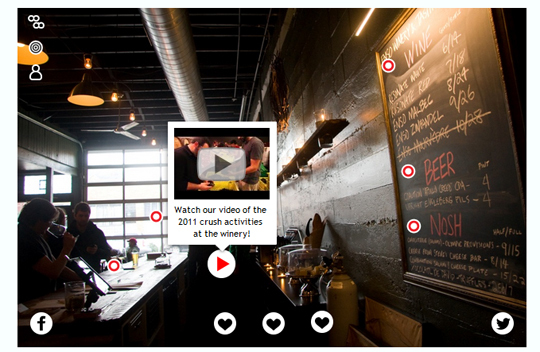 To illustrate how wineries might make use of this technology, we used a tool called ThingLink to tag two photos, one of a wine bottle and one of a winery tasting room. ThingLink was chosen because it’s easy to use and it’s free for almost all users (Taggstar appears to provide a very similar service). 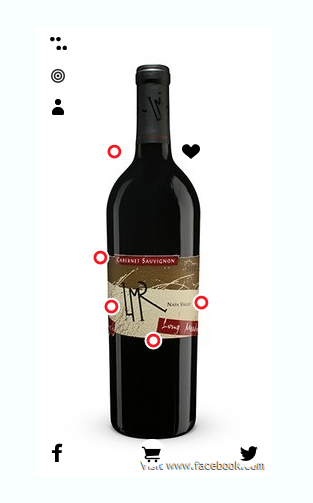 The first example provides information, in the form of text and links, associated with a particular wine. 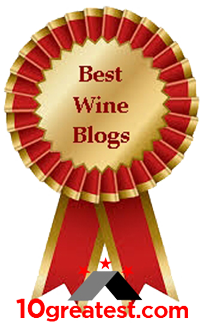 Typical types of wine-related embedded content include recipes, ratings and awards, vineyard and region information, technical details, a video of the winemaker describing the wine, and purchasing information. PLEASE GO TO THIS LINK to see how this image is all integrated with all the doodads and phufferettes. 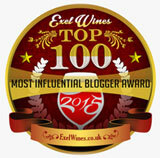 Excessive tagging of photos on a website may cause hunt-and-click fatigue, but the judicious use of tagging on a winery’s website, and especially on social media platforms such Twitter, Facebook, and Tumblr, has the potential to significantly increase user interest in, and engagement with, a winery’s digital content. Instead of just showing potential customers a beautiful winery or label photo, consider using your eye-catching images as a gateway to additional, interesting information about your winery and its products. While this may seem like overload to some, it’s going to really tantalize the most tech savvy among us… the early adopters. The rest will ultimately follow, or be the dying breed. In marketing, they’re called laggards, and that’s okay… I’ve got a few with my siblings… I dare to write this, because they’ll never read it, and I love them regardless. My response is pretty late, but nevertheless I wanted to share my thoughts. I’m not very big fan of Delectable because of many reasons, but it’s not the moment here to write about it. IMHO the biggest factor that Delectable might be real game changer in wine industry (digital part) is design. Comparing to other apps it’s almost brilliant. Design, user experience, usability are the areas which mark the biggest challenges to the wine industry players. Here is my opinion. I need to disagree with you that early adopters will pick it and rest will follow. One of the very first rules of marketing is “eves buy first”. Hard to disagree. AWG is a really great idea, but it’s definitely missing focus on design, “how-to-make-people-love-us-and-become-our-evangelists” approach is missing in my point of view. I didn’t have pleasure to meet Jim Finley, but if I’d have so, I’d tell him extactly this. Maciek, I agree with you. When we speak about online platform, using Google Maps API integration, creating non-existing solution for wine lovers, blah, blah, blah… than there is almost no excuse for having really poor design and no UX background at all (at least from my perspective). although it’s a geeky topic, digging deeper it’s priceless! My husband is a Webmaster. We HAVE to keep up with all of this, for our clients’ sake. I’m betting that if I ask him about growth hacking, he’ll be up on it… but, you’ll make me look good for asking. Years ago, I had him take an html class with me. At the time, he said, “I don’t need to take html 101, but I’ll go with you.” I told him I wanted him with me, because I was sick of walking across campus at night as a lone woman. As I learned how to construct two new websites (the first one in code and the next one in Dreamweaver), he was learning all the nuances I wasn’t getting. This really propelled him forward. Now he’s in it so deep that there are parts of what he’s doing that I’ll never fathom. But, I know that I know more than the average blogger and marketer, because I learned the language. I learned html so I could talk with Jose, telling him things I needed for our clients. I got into the wine business before he did, doing sales, marketing, and PR. This was BEFORE Websites were a sales tool. After constructing so many physical press kits for wholesalers, I knew that we needed to create a “trade” page, once we got past having to have a stie… so they could print their own darn POS. (LOL) Yeah… I was that far ahead of the curve, so growth hacking seems like today’s natural innovation in Web development for more SEO generated traffic. Someone had to innovate this one. It’s a gift that you’ve brought it to my attention. Thanks for taking the time to communicate with me. You have both really great story to be shared! 🙂 Actually I envy you just a little bit. As it comes to Growth Hacking – your reference is absolutely at the point. Very similar approach, but different tools. But there are just a few who know how to use this knowledge and leverage potential. Living in the global Ethernet.